Your favorite Greek flavors to go. 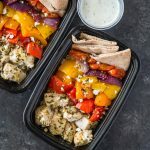 Healthy meal-prep bowls packed with brown rice, roasted chicken and veggies, pita and tzatziki sauce. If your following my meal-prep series than this is another great meal-prep recipe for you. 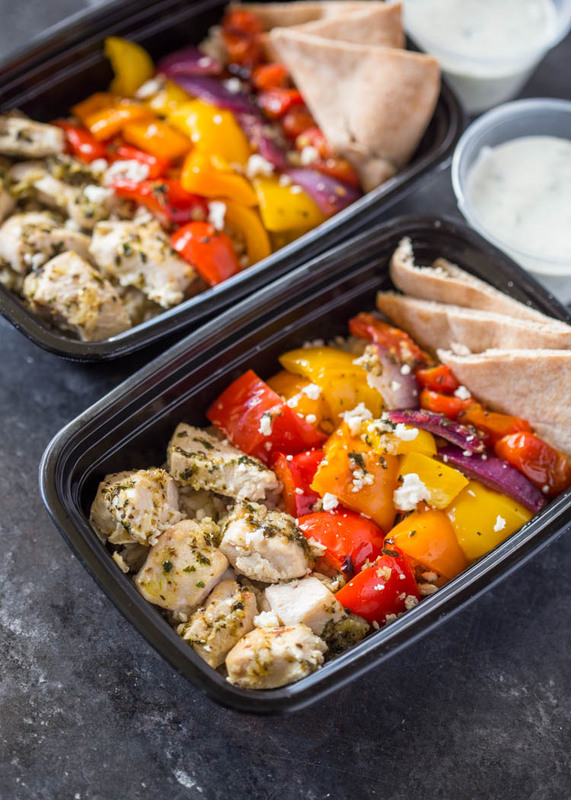 These healthy Greek inspired meal-prep bowls come together in under 30 minutes with very little effort. 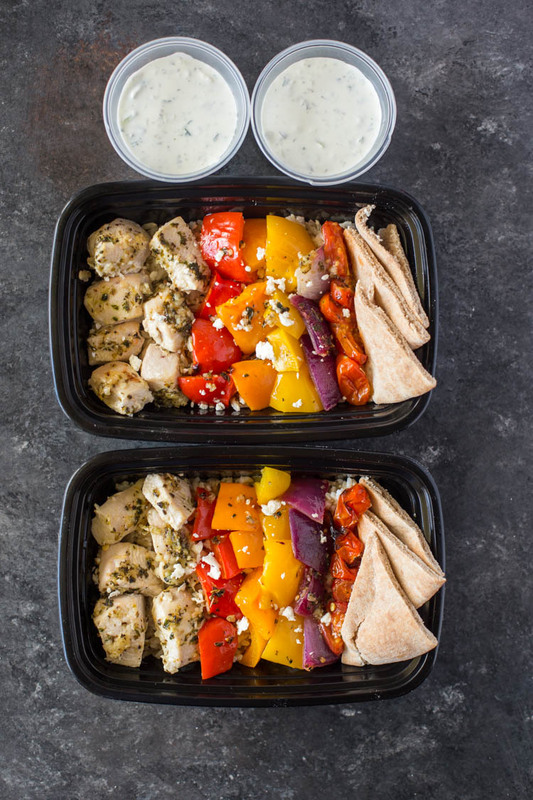 They are packed with chicken, veggies, brown rice, pita and a healthy yogurt tzatziki sauce. The chicken and veggies are coated with a flavorful Greek marinade then pan roasted for 20 minutes. While the veggies are baking, this delicious tzatziki is than prepared. It’s made with yogurt, cucumber, garlic and herbs. I like to place the tzatziki in small 4-oz portion cups so I can just pour the cold tzatziki on the chicken and veggies after heating. After the chicken and veggies are done, they are divided into meal-prep bowls along with brown rice and pita bread. refrigerate for 4-5 days and enjoy a healthy flavorful protein packed lunch that will satisfy and save you money too! To cook chicken and veggies: Pre-Heat oven to 450F. chicken and veggies on a large sheet pan to create a rainbow pattern. In a small bowl, combine all the ingredients for the marinade. Brush mixture onto chicken and veggies or toss chicken and veggies in mixture. Bake for 15-20 minutes or until veggies are charred and chicken is tender. To make Tzatziki: Whisk all the ingredients for the tzatziki in a small bowl. Divide mixture into 4 (4 oz) portion size containers or into any small containers with lids or into snack size ziplock bags. covered in place in the fridge. To assemble: Place 1/2 cup of brown rice into each meal prep bowl. Divide chicken and veggies mixture into the 4 meal-prep bowls. Cut 2 whole wheat pitas into 8 slices each. Place 4 slices of pita into each bowl. Cover and refrigerate for 4-5 days. To re-heat, Remove pita and heat chicken and veggies for 2-3 minutes in the microwave. Pour cold tzatziki on chicken and enjoy! Can you eat this cold? I don’t have a microwave at work, and there’s no point in reheating it in the morning if it’s just going to be cold again at lunch. On another note the recipe looks delicious, I can’t wait to try it!